It’s pretty safe to say that Battlefield 5 performed below expectations, even though its reviews were mostly positive. With physical sales in launch week down more than half on Battlefield 1, it seemed like fans were tiring of the churn and many of them were deserting the series for the greener pastures of the ever expanding battle royale genre. Even I, a seasoned Battlefield player who has enjoyed every other game in the series, decided to skip this one after finding it underwhelming at a Gamescom preview event. 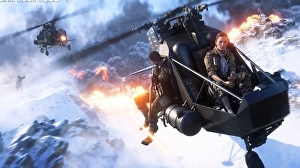 However, after going hands on with Firestorm, Battlefield 5’s take on the battle royale genre, I don’t mind admitting that I’ll be picking up a copy specifically to play that mode. Firestorm lives in the space between PUBG and Call of Duty: Blackout. There’s a sense of realism and tension there that war-sim fans will appreciate, but occasionally the action can ramp up in such a way that it starts to leans towards the arcadey-end of the spectrum. This means anyone who’s turned off by the cartoony antics of Fortnite or the intense speed of Apex Legends will feel right at home in Firestorm, but thanks to the ease of its loot system, casual players should also be able to pick up the game with relative ease.